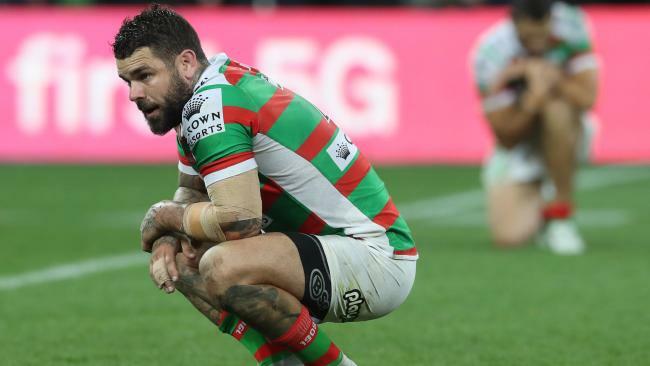 CLEARED of a serious shoulder injury, south Sydney halfback Adam Reynolds has been declared fit to laay in the Rabbitohs' elimination match next Saturday. 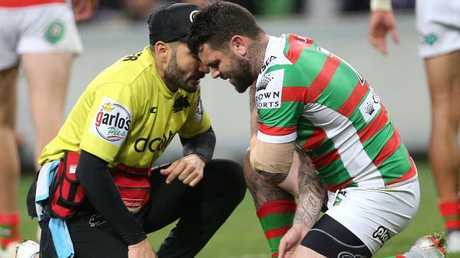 Reynolds sent a scare through the Rabbitohs camp when he was rushed from the field on the stroke of half-time in South Sydney's heartbreaking one-point loss to Melbourne on Friday night. While there were concerns about Reynolds' shoulder, it was his collarbone that needed pain-killing injections during the break. Reynolds finished the game and is no doubt to take on the winner of Brisbane/St George Illawarra. "I copped a whack and the shoulder is a bit sore but I got through the second half all right," Reynolds said. "It felt like something happened in there. The doctor said it was already so I got out there and finished the game. "(Felise) Kaufisi did it but Christian Welch got me a beauty after that as well. It's a game of football, you cop the bumps and bruises and move on." Any injury to Reynolds would have left South Sydney's premiership quest in tatters. Back-up half Adam Doueihi is out for the season with a knee injury, meaning the Rabbitohs would have had to manufacture a halves partner for Cody Walker. Reynolds was targeted by the Storm players. He was hit late by Melbourne flyer Josh Addo-Carr after kicking the ball, with the NSW winger penalised for the tackle. "It becomes dangerous," Reynolds said. "There were a couple of times there I thought it could have gone either way but it's up to the refs to decide. "I thought we were good in patches but we weren't at our best, but we'll look at the video and move on." The Rabbitohs returned to Sydney on Saturday afternoon with their focus now on preparing for next Saturday's clash against either St George Illawarra or Brisbane. The Broncos have beaten South Sydney twice this year, including one of Brisbane's best performances of the season - a 38-18 win in round 23. 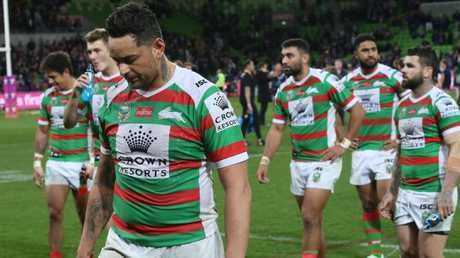 The Rabbitohs also had a four-point loss to Brisbane in round eight. They have won and lost won against St George Illawarra this year - with South Sydney victorious 24-10 in their most recent encounter in round 10. The match will be in Sydney. "I'm excited," Reynolds said. "We have a great playing group here and another chance to work on our game. "We pride ourselves on our game model and it wasn't good enough." South Sydney coach Anthony Seibold used just two players on his interchange bench, with Hymel Hunt and Dean Britt not seeing any game time despite the physicality of the match.